Ok now that we have those two things out of the way, we can get onto the recipe. I am sharing the recipe for making a triple batch. 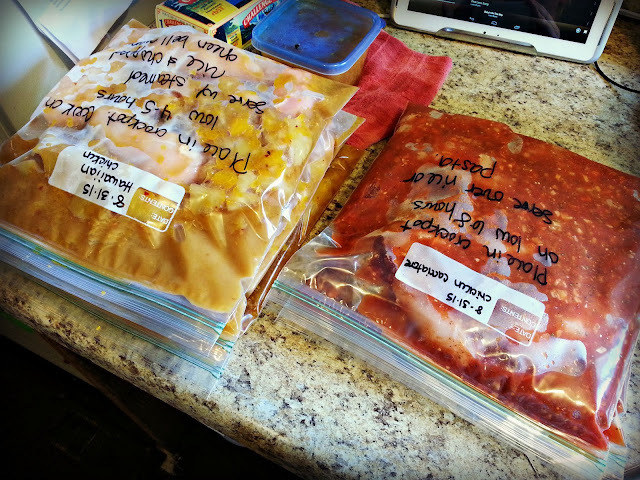 I ended up taking this triple batch recipe and fitting it into five freezer bags. Knocking out that many freezer meals in one shot is awesome. Oh and one single recipe of this meal serves 8-10 people. After I froze his recipe, and thawed a single batch for dinner, I placed it in the crock-pot. This was perfect for a busy Sunday. Dinner was ready for us when we got home. I only had to add the starch. Before serving I placed the chicken in my Kitchenaid mixer and shredded the chicken. Shredding the chicken allows it to go a bit further too. Thaw chicken mixture. Place in a crock-pot and cook on low for 5-6 hours. To serve, spoon over rice with toasted almonds. Thank you for posting this recipe, I can't wait to try it. I had one like it and misplaced it, it was so delicious! I just adore your blog, I love your testimony, and it truly does come across with every post, in the way you write, the way you teach your children and the way you teach us . . . your followers! Thank you! You know this sounds so GOOD! I wonder if you got pineapple packed in it's own juice and not a syrup if you could skip the lemon juice and just use the pineapple juice from the can? Hi I am wondering if you are using the make a mix cookery cook books on a regular basis?